This interview is part of the Institute's "Conversations with History" series, and uses Internet technology to share with the public Berkeley's distinction as a global forum for ideas. Welcome to a Conversation with History. 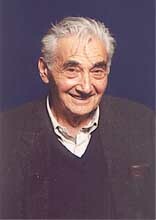 I'm Harry Kreisler of the Institute of International Studies. 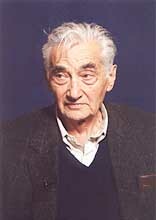 Our guest today is Howard Zinn. 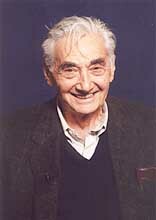 Howard Zinn is an activist, a historian, a writer, and a playwright. He is the author of many books, including A People's History of the United States, The Zinn Reader, and an autobiography called You Can't Be Neutral on a Moving Train. His three plays are Emma, Daughter of Venus, and Marx in Soho. He is a Professor Emeritus of History at Boston University. Experiencing War ... bombardier in World War II ... first use of napalm ... no questioning ... the myth of precision bombing ... no "good war"
Photos by Jane Scherr. Site questions: Email iis_webmgr at berkeley.edu.